As the Senate moves closer to a vote on the Marketplace Fairness Act of 2013 (S.743/S.336), numerous editorials and newspaper columns published this week expressed support for the bill’s passage. On Monday, April 22, the White House endorsed the Marketplace Fairness Act of 2013 (S.743). Later that day, the Senate voted overwhelmingly to move the bill to the Senate floor for debate. On April 21, the Marketplace Fairness Coalition, a diverse array of trade associations and businesses, including the American Booksellers Association, wrote to members of the U.S. Senate to dispute erroneous assertions made by eBay President and CEO John Donahoe about the Marketplace Fairness Act (S.736). In an April 19 e-mail to bookstore members regarding the class action settlement over rapidly rising Visa and MasterCard swipe fees, ABA recommended that members opt out and object to the settlement. Today, the American Booksellers Association announces the winners of the 2013 Indies Choice Book Awards and the E.B. White Read-Aloud Awards, as voted by independent booksellers nationwide. In her bimonthly letter to members, ABA President Becky Anderson looks at some of this spring’s opportunities for booksellers to come together to learn, share ideas and concerns, and take part in special events. The U.S. Senate may vote on the Marketplace Fairness Act of 2013 as early as next week. Senate Majority Leader Harry Reid plans to bring the bill directly to the floor for a vote without first referring it to the Senate Finance Committee, according to published reports. Promotional materials are now available to all ABA member stores participating in Give Me Summer! Give Me Books! a national summer reading program for kids. Six titles tailored to children in each of three age groups — Kindergarten–Grade 2, Grades 3–5, and Grades 6–8— are featured. In response to the success of the Bookseller/Publisher Focus Groups at Winter Institute 8, ABA has arranged a series of focus group meetings to be held during BEA. Booksellers who are interested in meeting with publishers to discuss issues of common interest and mutual concern must sign up by May 3. A special section of this year’s Children’s Book Art Silent Auction at BEA will honor the late Maurice Sendak, the beloved author and illustrator of classic children’s titles and a passionate defender of free speech. A number of illustrators will be creating special artworks commemorating Sendak that will be auctioned off at the event. This season’s schedule of 11 ABA Booksellers Forums will come to an end on Wednesday, May 8, in Maplewood, New Jersey. From April 15 through May 13, any Kobo eReader device purchased at an ABA member bookstore will come with a free copy of the Algonquin eBook What My Mother Gave Me: Thirty-one Women on the Gifts That Mattered Most, edited by Elizabeth Benedict. Indie booksellers are gearing up for the April 23rd celebration of World Book Night with parties and book pickup events planned at hundreds of locations across the country. World Book Night has released a list of the towns, cities, and regions that are home to the most volunteer givers per capita. Bookstores participating in this spring’s Celebrate Moms With Indies promotion must place their orders with publishers by May 1. For the Dads and Grads promotions, titles must be ordered by June 3. As the Marketplace Fairness Act of 2013 continues to gain momentum in the U.S. Congress, three more states are considering enactment of sales tax fairness legislation that would level the playing field for Main Street retailers. Last week, hundreds of small business owners met with elected officials in Washington, D.C., to communicate firsthand the need to pass the Marketplace Fairness Act. Participants in the two-day fly-in included Sarah Pishko of Prince Books and ABA Board member Sarah Bagby of Watermark Books & Café. BookExpo America is right around the corner, and booksellers who want to take advantage of free trade show badges, exclusive parties at Hotel ABA, and special programming for ABC Children’s Group members, as well as be a part of the Celebration of Bookselling and Author Awards Lunch and the Bookseller/Publisher Focus Groups, must be current on their ABA dues. The 2013 Pultizer Prize for Fiction was awarded on Monday to The Orphan Master’s Son by Adam Johnson (Random House). Johnson is an avid supporter of independent bookstores, and is part of the Why Indies Matter video campaign. Six e-book promotions were recently added to the IndieCommerce Publisher Promotions page. Categories include humor, teen reads, great leaders, thrillers, and steals and deals. Tuesday Roundup--More Recently Issued World War I Novels from P.S. Duffy, Thomas Kenneally, JoJo Moyes, and One Classic from Frederic Manning. "The target audience of 'The Dogs of Christmas' will clearly be dog lovers, but I would also recommend it to people who think they aren't dog lovers. They just might be surprised!" "EL: If your book could go on a cross country road trip with another book, what book would that be,..."
Check our this Independent Bookselling Video from our friends at Simon and Schuster! 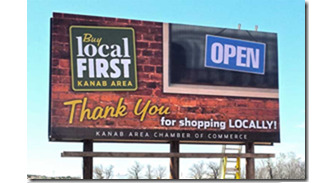 A billboard in rural Kanab, Utah, funded by the Kanab Area Chamber of Commerce and designed by Local First Utah. Staff Login | Masthead | Contact Us | Copyright © 2015 American Booksellers Association. All Rights Reserved.